In the looming battle over Gov. Rick Snyder’s proposed personal property tax repeal, both sides agree on one thing: It’s a tax neither particularly likes. "This is an investment penalty," said Lt. Governor Brian Calley before a Senate committee Wednesday. "The more you invest, the more you pay." 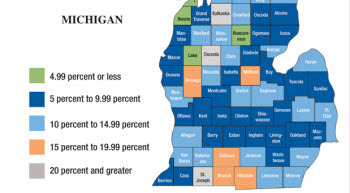 The Michigan Chamber of Commerce and the Michigan Manufacturers Association, among others, echo that view, saying the PPT discourages new businesses from moving to Michigan and existing companies from expanding. Since the personal property tax is assessed on equipment inside those buildings, local governments rely on businesses to report when they buy machines, desks, computers and other furnishings. As Hamtramck Mayor Karen Majewski said at a rally to protect local government funds generated by the PPT, "The personal property tax is cumbersome." Calculating the taxable value of equipment is time-consuming and expensive for business and government, partly because Michigan uses a different set of depreciation tables than the federal government, a recent study by the Anderson Economic Group found. Complying with the personal property tax costs businesses on average 37 percent of the revenue the tax generates, the study found. In some cases, it costs businesses more to comply with the law than the amount of personal property tax they pay. “We are not aware of any other major statewide tax that has compliance costs of this magnitude,” the study’s authors wrote. The plan to phase out the personal property tax on large industrial companies and exempt smaller industrial and commercial businesses with taxable assets of less than $40,000 appears to have strong support among Republicans, who control both houses of the Legislature. The repeal has similarly strong support in the House, said Ari Adler, a spokesman for House Speaker Jase Bolger, R-Marshall. “I think we have significant momentum behind this,” said Mike Johnston, the Michigan Manufacturers Association’s vice president for government affairs. That’s one reason organizations representing local governments and public schools aren’t so much opposing repeal as they are pushing a constitutional amendment to guarantee the lost revenue will be replaced. That approach, however, drew a chilly response during the first hearing on PPT repeal in Lansing Wednesday. "I beg you to drop off this constitutional amendment stuff." A constitutional amendment requires a two-thirds vote of both houses to place it on a statewide ballot and majority approval ofMichiganvoters. If the Legislature fails to approve the amendment, backers could try to force a statewide vote, but first would need to gather some 258,000 valid petition signatures. Senate Minority Leader Gretchen Whitmer, D-East Lansing, said lawmakers might come up with a way of guaranteeing replacement revenue short of a constitutional amendment. “I think as a piece of legislation starts to move through the process, we’re going to fight every step of the way to be sure the replacement revenue is there,” she said, adding she does not oppose repealing the personal property tax. "At the end of the day, everyone's going to have indigestion." I guess my concern is where does the funding shortfall come from? The premise is that it will be made up by the State. Will it come from revenue sharing which has been tied to "Best Practices" as deemed by the Gov. I'll bet it means the non-business owner taxpayers will be funding this pro-business tax cut. Another example of the Republicans touting their "Jobs are number 1" slogan and not creating anything other than an increase to the bottom line. Let's face the facts - the only real jobs being created here are by the Auto sector and it I remember correctly the Obama Administration's bail-out resulting in the ability to sustain and create new jobs. The tax cuts for big business were not tied to anything at all - not a showing of jobs created, additional training for employees or anything remotely tied to improvements other than improving the bottom line. How stupid are we in this state. @Pat LePage - your concern about where the shortfall will come from is wildly misguided. Why should the shortfall come from anywhere - why not reduce inefficiencies in local governments? When individuals and businesses see their revenue decrease, the response is to spend less and be more efficient with the money they do have. When government sees it's revenue decrease, the response is to raise taxes, rather than eliminate inefficiencies and make necessary cuts. The problem with government is that it continues to grow larger as long as you keep feeding it tax money. Government is inefficient and wasteful, since it's not their money that they're spending. Giving them more to spend is rarely an efficient use of resources. Comments that suggest this should have been dealt with before the MBT are exactly right. THIS is the tax that hurts business growth, but it needs to be eliminated in a way that does not further damage the ability of local governments to keep our communities competitive. Regardless of the tax structure, no company will locate in a town where basic services and quality of life are permanently on the decline. The local governments have a real concern about legislative promises to make up revenue shortfalls. The state has never fully funded its legislative mandates to support fire services in communities with state facilities. Detroit waits for added revenue sharing dollars they were promised when they lowered their local taxes. The promise of state revenue sharing in exchange for local sales tax authority has been eroded. While I believe there are many things in the state constitution that would better bet dealt with legislatively, reliance on the constitution is a necessity born of experience.